"With a little nudge from the American Civil Liberties Union, four St. George high schools in Utah have approved Gay-Straight Alliances clubs for the first time. Logan Hunt (pictured left), a senior at Dixie High, and Jason Osmanski, a sophomore at Snow Canyon High, attending Snow Canyon's Homecoming dance last fall. Both students have successfully submitted applications for Gay-Straight Alliances clubs at their schools." Starting in fall 2010, Desert Hills, Dixie, Pine View and Snow Canyon high schools will have after-school forums specifically for lesbian, gay, bisexual and transgender (LGBT) students, along with their straight friends and allies. Nationally, there are 4,000 such clubs registered with the Gay, Lesbian and Straight Education Network (GLSEN). The clubs promote safe school climates for all students, regardless of sexual orientation or gender identity. Last fall, a small group of St. George students launched an effort to form a Gay Straight Alliance at every high school in the Washington County School District. 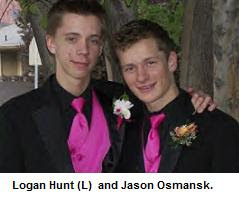 "We felt alone," said Logan Hunt, a gay senior at Dixie High. "We were worried about our [LGBT] friends we had met. They were often depressed. ... We wanted to create more tolerance in our community for everybody." Gay-Straight Alliances (GSAs) are student clubs that work to improve school climate for all students, regardless of sexual orientation or gender identity/expression. 4,000 GSAs are registered with GLSEN.